Today in Masonic History Joshua Barney is Born in 1759. Joshua Barney was an American naval officer during the Revolutionary War and the War of 1812. Barney was born in Baltimore, Province of Maryland on July 6th, 1759..
Barney began serving in the Continental Navy in February 1776. He would first serve on the Hornet as a master's mate or non-commissioned officer. On the Hornet he would take part in the attack on the island of New Providence in the Bahamas. He would later serve aboard the Wasp and the Andrew Doria. On board the Andrew Doria he took a preeminent part in the defense of the Delaware River. During Barney's service during the Revolutionary War he was taken prisoner several times. One time being imprisoned in Old Mill Prison in Plymouth, Devon, England. He escaped from prison and recounted the escape in a book he wrote entitled The Memoirs of Commodore Barney which was published in Boston in 1832 after his passing. In 1782, Barney was put in command of the ship Hyder Ally. With that ship he was able to to capture the HMS General Monk, a vastly superior ship. Barney took command of General Monk and sailed it to France with dispatches for Benjamin Franklin. He returned to the Americas with news that peace had been declared. After the war, Barney joined the French Navy. There he was given command of a squadron. At the beginning of the War of 1812, Barney was coming from an unsuccessful career as a privateer. He joined the United States Navy as a Captain and was given the responsibility of defending Chesapeake Bay. 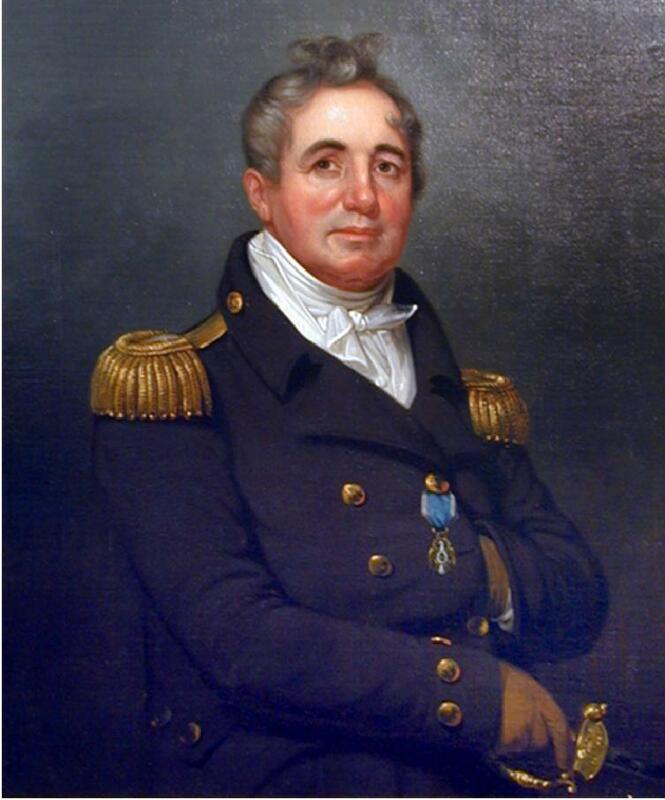 He authored a plan for the defense of the Bay, which was approved by the Secretary of the Navy. He used shallow draft barges loaded with guns to annoy and attack British vessels and then retreat with them to shallow waters. In 1814, Barney and his flotilla were pursued by several British ships and were forced to retreat up the Patuxent River. The British ships with their deeper drafts were unable to follow. The British ships in frustration began burning towns and farms along the river. Barney led his sailors and marines in the Battle of Bladensburg in defense of the Nations Capitol. The battle was unique because it was one of only two times that a president, this time President James Madison, would use his authority as Commander-in-Chief on the battle field. The only other time was President George Washington during the Whiskey Rebellion. Barney and the rest of the troops defending the Capitol were forced to fall back before getting cut off. The British would go on to burn the Capitol and the White House. Barney was wounded in the Battle. On December 10th, 1818, Barney while en route to Pittsburgh, Pennsylvania passed away from the wound he received in the war. The bullet could not be removed from the wound he received at the Battle of Bladensburg. Barney was a member of the Lodge of the Nine Sisters, in Paris France.